LAS VEGAS – A year ago, Tanner Aus waited until the final night of the season to win a round at the Wrangler National Finals Rodeo. 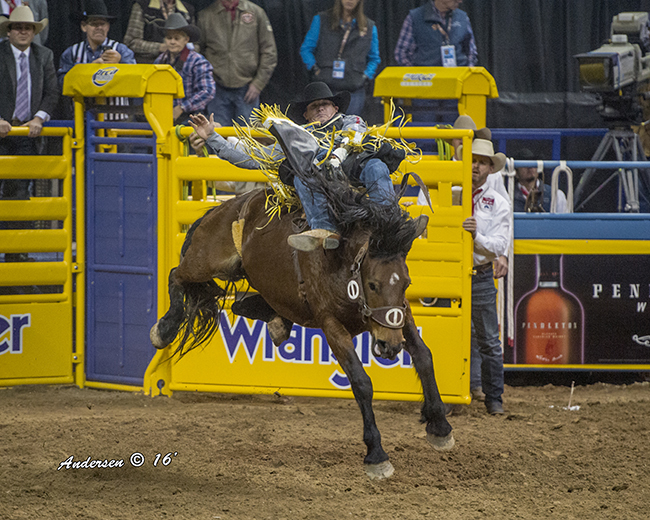 He made it happen in a hurry at this year’s championship with an 85.5-point ride on Cervi Rodeo’s Control Freak during the first round on Thursday night. He earned $26,231 and moved to No. 2 in the world standings after just one night of ProRodeo’s grand championship. He had his way in the arena primarily by the spurring motion he made to match moves with the horse. With every special twist Control Freak had, Aus continued to make solid moves through the eight-second ride. It also pushed his season earnings to $148,915 with nine more of the richest go-rounds remaining. He is living a dream season that he has held tightly to through every night’s sleep since he was a toddler, and he understands the family support that must come his way if he is to be successful in the game he loves. Although he sits second in the standings, he trails the leader, Tim O’Connell, by more than $55,000. But with rounds paying more than $26,000 a night, he has a chance to catch up quickly. The ultimate goal, of course, is to finish atop the money list at the end of the season to earn that coveted gold buckle.